The Mozilla Webmaker teams are excited to present the WebLitMapper to the community for testing. This is a prototype of something that we think might be useful in a future iteration of webmaker.org. What is it? 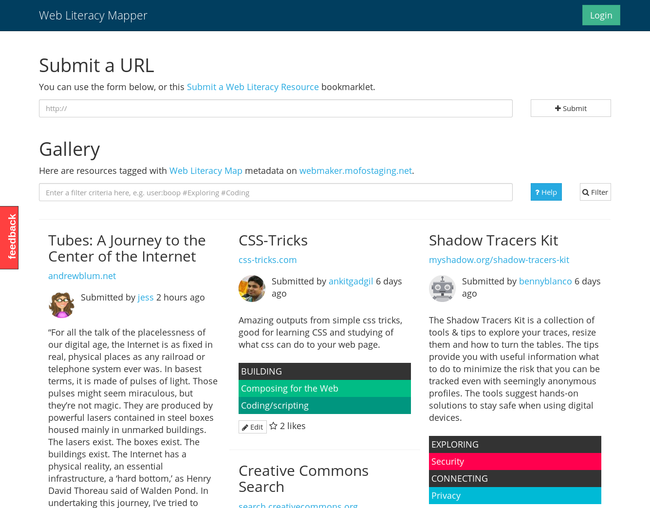 A bookmarklet that allows you to tag resources from around the web with the competencies from the Web Literacy Map. We imagine people using it in a similar way that they might use a bookmarklet from Delicious, Pinterest or Diigo - but specifically focused on web literacy-related resources useful for teaching the web. Everything you need to know to use the bookmarklet and help us test it is on the etherpad above. If you’d like to help us test what we’re working on over the coming months, you might want to stop by this wiki page regularly. Better yet, why not attend our weekly #TeachTheWeb community calls?